Abbreviations. Terms and definitions. Biochemical values. Haematological values.1 Introduction to surgery. 2 An introduction to surgical techniques and practical procedures. 3 Investigative procedures. 4 Shock and trauma. 5 Preoperative and postoperative care. 6 Infection and surgery. 7 Management of malignant disease. 8 Head, neck and otorhinolaryngology. 9 Thorax. 10 Breast. 11. Endocrine surgery. 12 Abdominal wall and hernia. 13 Acute abdomen. 14 Alimentary tract. 15 Peripheral vascular disease. 16 Urology. 17 Orthopaedics. 18 Neurosurgery. 19 Plastic surgery and skin. 20 Paediatric surgery. 21 Organ and tissue transplantation. 22. Gynaecology. The Fourth Edition of this highly-praised pocketbook provides a concise and didactic account of the essential features of the more common surgical disorders, at both a size and price to suit the pocket. The book covers basic principles, as well as providing essential information on aetiology, diagnosis and management, including pre-operative and postoperative care. The text covers the field of general surgery but also covers the basic needs of the undergraduate as far as the surgical specialities are concerned. The book helps you with the essentials of history-taking, what physical signs to elicit, the differential diagnosis, what investigations to order and how to treat the patient. The text is illustrated with line drawings and imaging. 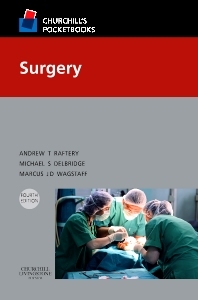 Provides comprehensive coverage of general surgery, as well as an outline of the essentials of the surgical specialties. Identifies the basic principles together with key information on aetiology, diagnosis and management, as well as pre- and post-operative care. Includes an overview of history-taking, relevant physical signs, differential diagnosis, investigations and practical treatment.